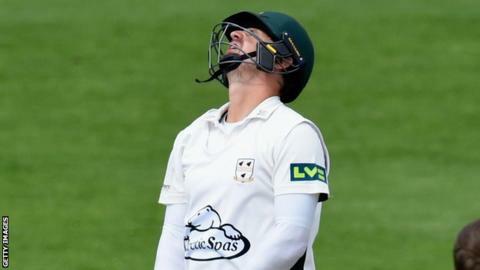 Worcestershire batsman Alex Gidman has undergone delayed surgery after fracturing a finger in the penultimate week of the 2015 season in September. The 34-year-old former Gloucestershire captain capped a disappointing first year at New Road when he suffered the injury during fielding practice prior to the away game at Durham. It was expected to heal without any need for an operation. But a later x-ray revealed slight damage to the cartilage in the joint. That left him unable to flex the joint, and he has now had a plastic joint fitted into his left index finger. His recovery is expected to take up to 12 weeks, and he may have to field with protective taping next season, but he should be comfortably in time for the 2016 campaign. Gidman, who was signed from Gloucestershire on a two-year deal, scored just 440 runs in 13 County Championship matches for Worcestershire in 2015 at an average of 24.44. That was well short of his first-class average of 36.31. He also made one appearance in both the One-Day Cup and the T20 Blast.